Why are birthdays so hard? Birthdays are supposed to be happy occasions where celebrations, being spoiled, and positive reflection are all part of the day. However, some people feel a sense of dread every time a birthday approaches. 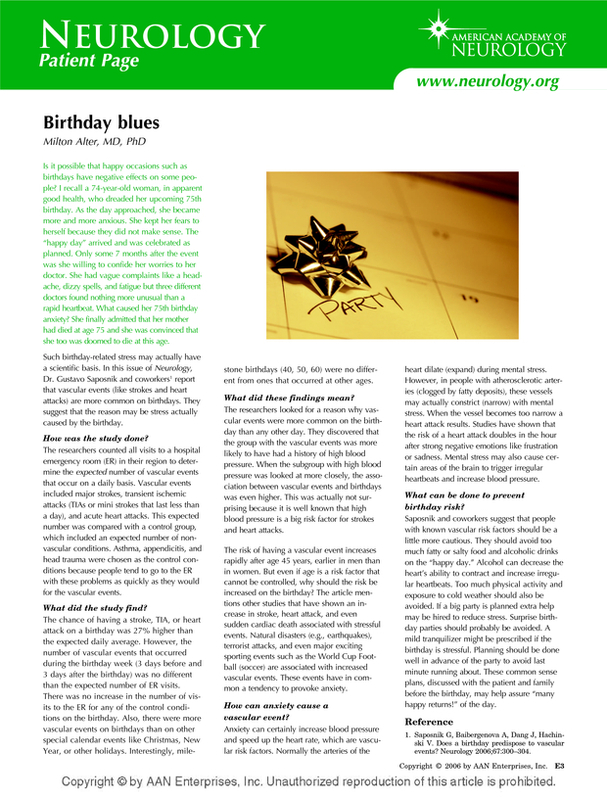 For these individuals, the prospect of enjoying a birthday occasion are diminished because they feel depressed, stressed, and anxious instead of feeling excited and positive about the day. Feeling depressed about an approaching birthday, as a person ages, is common, and having the birthday blues is a different emotion to depression that is continuous. Symptoms of birthday depression may be similar to chronic depression. Some of the symptoms listed above are similar to those experienced by people with chronic depression. Trying to think positively right from the outset is a good place to start. Doing so will ensure a person is in a good frame of mind to enjoy the rest of their day. It may be helpful to start each birthday by listing things to be grateful for in life. Making a special breakfast and doing something to start the day happily are other suggestions, be that watching a movie in bed or going for an early morning run. If someone has to go to work on their birthday, they can consider treating themselves to a beverage or other favorite treat on the way, to add a little variety to their day. Birthdays are days where it is acceptable to be a bit selfish. If someone loves extravagant celebrations, then they should try to have that sort of a day. If they prefer quality time with family, then they could make arrangements, so that happens instead. On the other hand, doing something on their birthday that they do not enjoy, will make it harder for them to have a good time. Too many plans can be stressful and put additional pressure on the birthday. If birthday blues are an issue, a person can try to keep things simple and easy to lower the risk of anything going wrong. Being realistic about what to expect from a birthday will help to avoid disappointment. This may be especially true if it involves receiving phone calls from family members with whom a person may have a less than stellar relationship. Whatever kind of day it ends up being, a person should try to look for the positives and be thankful for any effort friends and family have made, however small. Doing so will make them feel special, no matter what. If the birthday blues threaten to have a negative impact on someone, it may be better to avoid the day altogether. Keeping busy and distracted will ensure that the day passes quickly and can be easily forgotten so a person can move on with their life. Instead of mourning a lack of achievement and beating oneself up, it is far more beneficial to focus on what has been accomplished in preceding years. By doing so, a person is more likely to lift themselves out of the birthday blues and remember what makes them proud. If people are likely to forget about someone's birthday, then there is no harm in reminding them before the day. There is nothing wrong with alerting family and friends so that they remember to make a fuss of someone when their birthday arrives. What are the early signs of a depression relapse? Depression has many causes, but it is very complex and, sometimes, people may be unaware that they are depressed. Learn the signs of a depression relapse here. It is OK to be sad sometimes, but wallowing in sadness all day is unhelpful for anyone struggling with negative emotions. For those who always get the birthday blues, it might be a good idea just to accept that they might feel sad. They can allow those feelings to come into their mind, acknowledge them, and then put them to one side and get on with the day in a more positive frame of mind. Being too reliant on other people for happiness is never advisable. A person should make exciting plans for themselves if there is a chance no one will remember their birthday. There is nothing more positive than remembering to look after and love oneself, after all. Sometimes it is important to grieve for the things that have been lost, whether that is sad things that have happened in life or just the passing of time. It is healthful to allow time to grieve and make peace with these facts rather than fight against them. Some studies have shown the positives associated with getting older. One study, which observed adults between the ages of 21 and 100 years old, discovered that there is an improvement in self-reported mental health by those who are older. Another study showed that younger people tend to be more neurotic than older people. Even if someone is feeling unfulfilled or dissatisfied on their birthday, instead of wallowing in it, they can use it to reflect on what is causing them to feel this way. They can then try to work out how to address the problems and negativity around these emotions. However much a person hates or dreads their birthday, they can make it better if they plan something for that day that cannot fail to bring them excitement. They may think about booking to see a show, get a massage, or go out for dinner. Whatever is likely to lift their spirits and distract from the sadness they are feeling may help them feel better. If nothing else, people can use their birthdays to be productive. If they write down some goals and some ways to change for the next year, they can end the day on a positive note and feel inspired and motivated to have a better birthday next time around. Turning older may be a cause of the birthday blues. For most people, birthdays used to be great fun when they were younger. Then, they would count down the days until their birthdays and be full of excitement and wonder when they arrived. People may have celebrated with presents, had parties, and enjoyed the fuss that our family and friends made on our behalves. Unfortunately, as some people get older, their birthdays can signify things that make them feel depressed. Turning older can be a difficult adjustment. Most people, at a particular time in their lives, would prefer to turn back the clock and stay youthful for longer or even forever. It can feel as though the years start to pass more quickly. Wrinkles appear, bodies change, and people feel a sense of responsibility that they never felt in our youth. Hitting those 'big birthday' milestones, such as 30, 40, and 50 can make this more apparent. It can feel as if life is passing by at a frightening pace, and each birthday is a reminder of how quickly time is running out. Birthdays can be a time of reflection, and for people with the birthday blues, this can cause immense pressure. If a person feels that they are not where they hoped they would be in their lives, this can be upsetting. Disappointment and feelings of worthlessness can creep in if people have not been able to live up to our expectations, and these feelings can be hard to cope with on a birthday. Another reason a person might have the birthday blues is if they have high expectations of the day, which are impossible to meet. If they thought they would get a particular gift, or there was going to be a surprise party, or something spectacular was going to happen, and these things fail to materialize, it is easy to think that perhaps people do not care. This elevated expectation can leave a person feeling insecure and unloved. While birthdays can feel stressful and depressing for some people, there is no reason why they need to be sad occasions. It may help if people try to remember that a birthday can be anything they want it to be. If people can get rid of those negative feelings and makes solid plans for their birthdays, these occasions can be fun again. Cadman, Bethany. "Why are birthdays so hard?." Medical News Today. MediLexicon, Intl., 27 Feb. 2018. Web.